One of the most influential Latin American artists of her generation, seventy-nine-year-old Regina Silveira is a small, stout woman with a throaty rasp and formidable energy demonstrated in her six-decade body of work. Silveira is one unafraid of challenge. She escaped the constraints of the flat painted surface by creating content in unconventional perspectives by mastering the art of shadow. 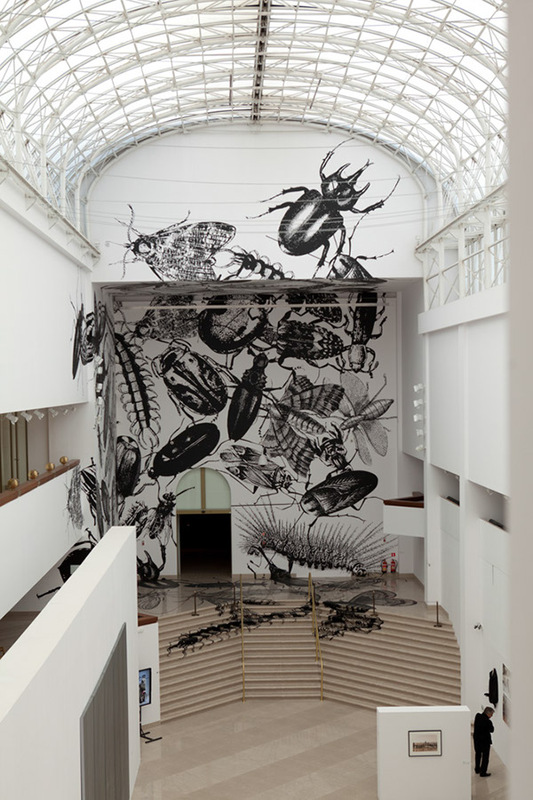 “EXIT” is her latest solo show, with forty works on display at São Paulo’s MuBE (Museum of Brazilian Sculpture and Ecology). 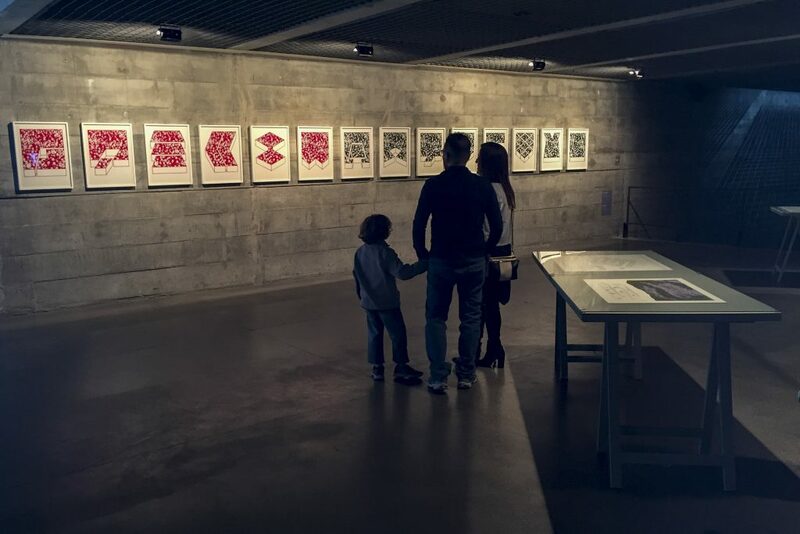 Among them are more than three dozen rare engravings on paper produced from 1971 to 1976 focusing on sociopolitical themes of the Years of Lead during Brazil’s military coup d’état. 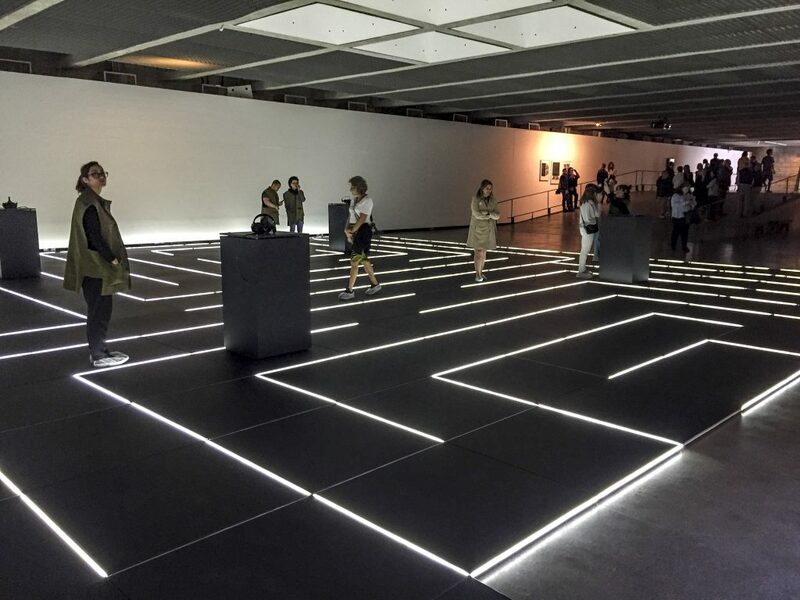 The highlight is the near two-hundred-square-meter floor installation “Borders,” which explores geopolitical frontiers and is activated when you put on virtual reality headsets and walk through a maze generated by algorithms that recalls the anguishing labyrinthine system that has fed mankind’s imagination since ancient Greece to today’s physical and psychological frontiers. In 1958, Silveira graduated in visual arts in her native town of Porto Alegre, capital city of the southernmost state of Rio Grande do Sul, where one of her teachers was none other than Iberê Camargo (1914-1994), Brazil’s foremost expressionist painter. With the country under military dictatorship in the 1960s, the striving young artist won a scholarship to study in Madrid, got married, and from 1969 to 1973 taught at the University of Puerto Rico along with her husband, Spanish-born conceptual artist Julio Plaza (1938-2003). 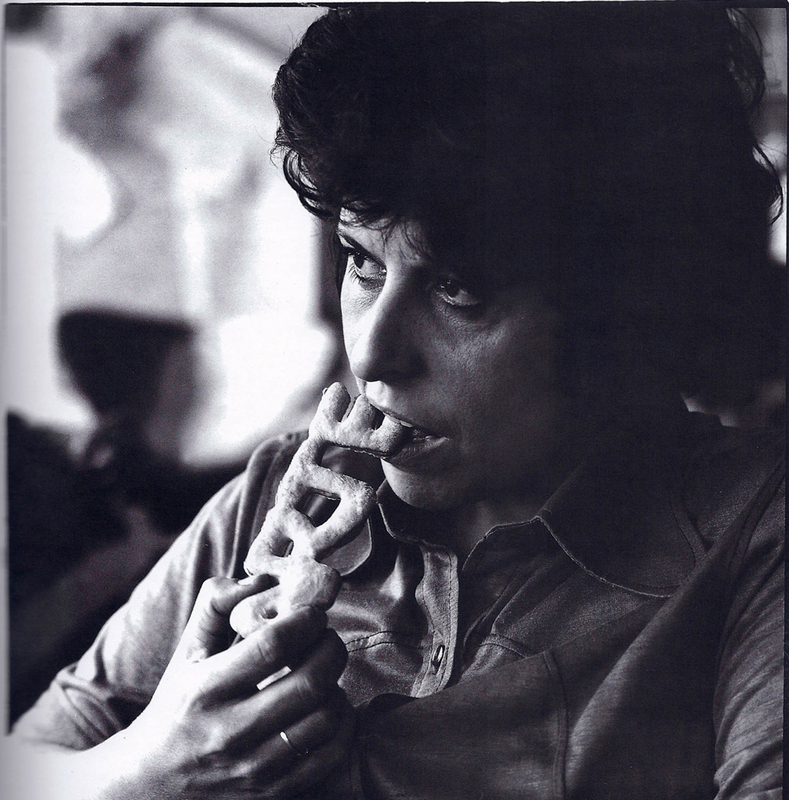 She finally established herself in São Paulo and taught arts until 1985. In response to the hostile political environment of the 1970s, Silveira engaged in conceptual ephemeral art creating pamphlets, mail art and video, becoming one of the first Brazilian artists to produce art for the electronic medium. 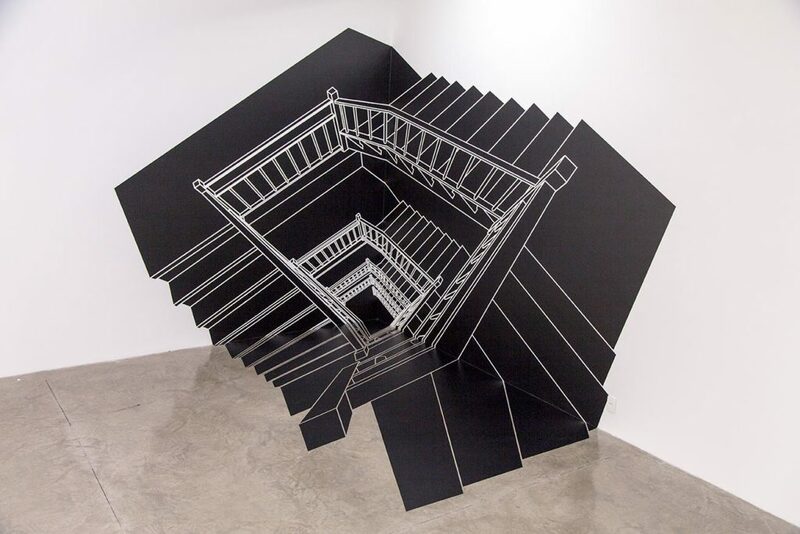 Since the 1980s, the artist has been developing a painstaking enigmatic body of work using sciography, the projection of shade and shadow in architecture, that she is able to transform into clever illusionist perspectives in complex site-specific interventions that have grown in scale dramatically since she adopted the computer in the 1990s. 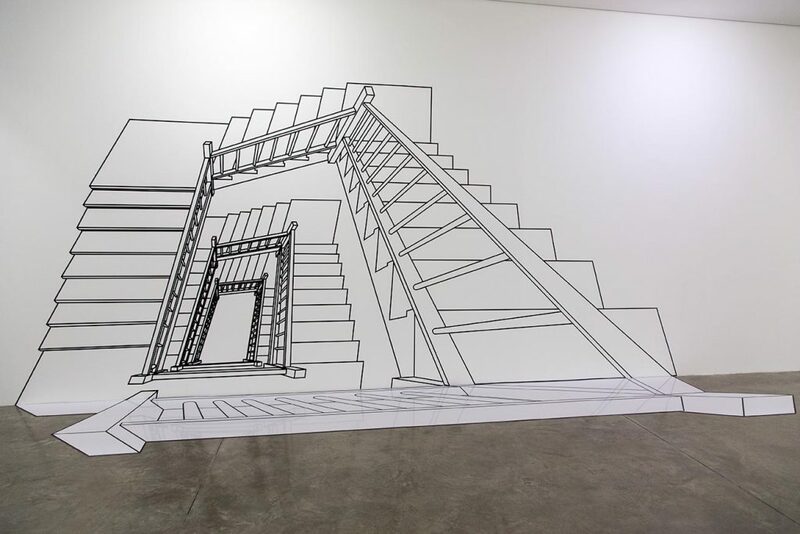 These esthetic charades between reality and the imaginary are spirited visual parodies of banal objects such as stairs, tire tracks, scissors, penknife, corkscrew and artist’s easel, as well as bugs, snakes, human footprints, paw prints and the palm of the hand. Admired by young and old alike for their strong graphic appeal, these shadowed objects and distorted architectural perspectives were initially designed on graph paper and laboriously scaled up using black paint on the walls. The technique moved on to be designed on black vinyl tape cut by hand or machine and adhered to vertical or horizontal surfaces. Today her poignant perspective is computer-generated and covers large public areas and building façades such as “Lumen,” at the Palácio de Cristal, Museu Reina Sofia in Madrid, in 2005; “Irruption” Series (Saga), at the Museum of Fine Arts in Taipei, in 2006; and “Tramazul,” that covered the entire Paulista Avenue façade of the Museu de Arte de São Paulo (MASP) in 2010. Silveira has been granted scholarships in the States from The John Simon Guggenheim Foundation, The Pollock-Krasner Foundation and Fulbright Program (1994), as well as residencies at the Banff Center for the Arts, Canada, and Civitella Ranieri Center, Italy. 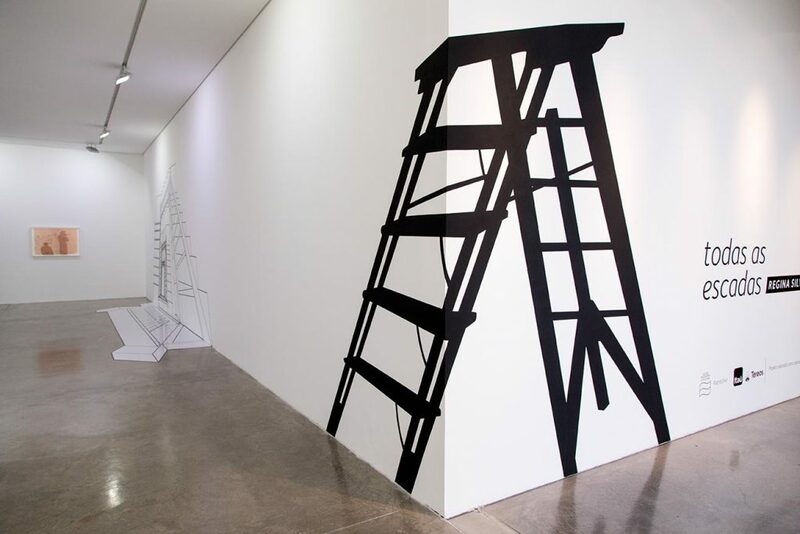 She has participated in four editions of the São Paulo Bienal, as well as in three of the Havana Biennial. 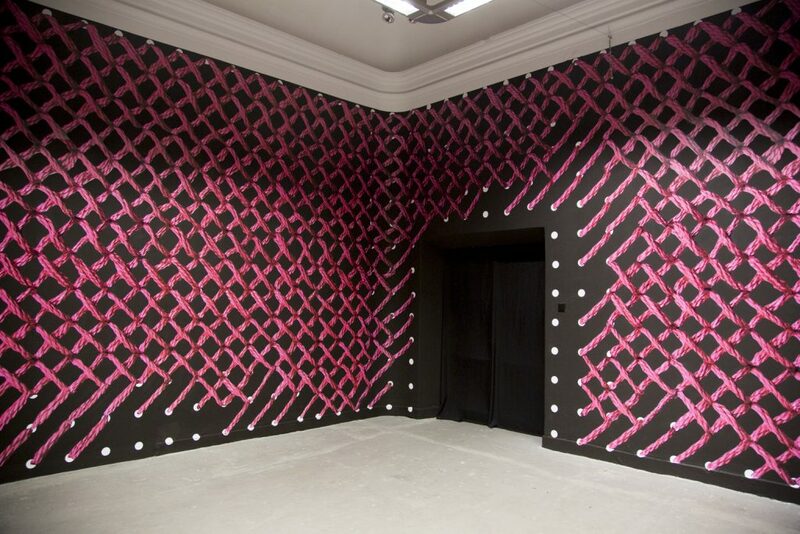 Regina Silveira’s work is present in several collections such as Museum of Contemporary Art San Diego, New York’s MoMA and São Paulo’s Pinacoteca. 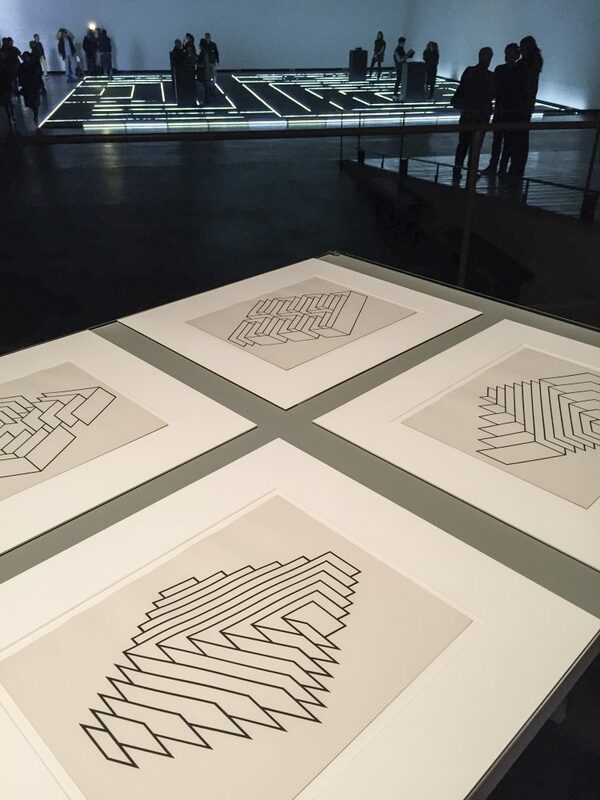 Regina, the labyrinth has been a recurring theme in your work since the 1970s. 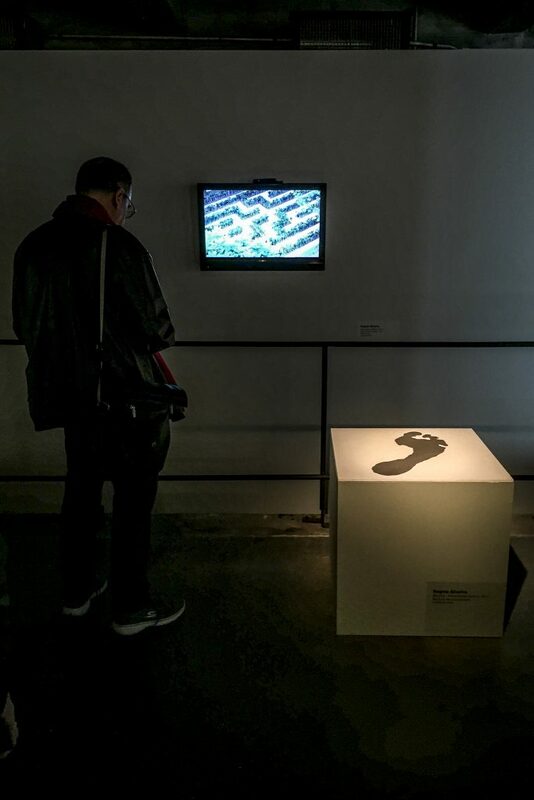 Is the grand installation “Borders” now in your exhibition EXIT at São Paulo’s Mube museum related to these labyrinthine political times we live in? Naturally. These difficult times, with excluding walls that segregate are everywhere, be they physical or merely moral walls. However, if the labyrinths have inhabited my work for decades it is because they are important immemorial mental images that have stood the test of time in stories and other cultures. For me labyrinths are tools to tackle through images the many ways our lives are affected and controlled by compartmentalization. How did your first experiences with the shadow come about? My first shadows are from 1981-1982, the “Enigma” series, with four photograms of shadows of absent objects on top of a mound of banal things like a land line telephone, pan, my own handbag, typewriter… Those nonsensical ideograms provided my entry in this territory I have explored with different intentions and means for some decades. Was it literature that bought about the insight on shadows of architectural spaces and banal objects as a mainstay in your oeuvre? Even though I was aware of the rich approach that shadow and its meanings have had on literature, in film and theater, and even in children’s classic books, the insight did not come from there but from the geometry of distortions that I applied to other figures and to spaces. To better understand my shadows, it is important to know they have never been natural images—such as those focusing light over opaque objects—rather they have been geometric constructions from the start. Although the shadow has become a recurrent theme in my work, it was not my first choice to interfere on architecture and space. To obtain these graphic “coatings,” my imagery led me to traces of animal, industrial and human origins. After the new millennium, I migrated from the paradigm of the shadow to that of the light (two extremes of the same axis) in several works related to architecture and urban space. Would you say the shadow, an element of psychological interiorization, came about in your work because you studied art with Iberê Camargo (1914-1994), our greatest expressionist artist? This was one of the topics analyzed in the critical text by professor Jennie Hirsh of the Maryland Institute College of Art based on my 2010 exhibition at the Iberê Camargo Foundation in Porto Alegre. She analyzed my trajectory and that of Iberê and his master, Giorgio De Chirico. I was very touched with the “lineage”! However, my relation to master Iberê always had to do with his poetic and professional attitude. He was a complete artist, obsessively involved with the contents he wanted to express. Even in his most advanced stages of abstractionism he was never a formalist painter. To see him paint as I witnessed many times was a lesson on the concentration and total involvement an artist should dedicate to his work. What is the greatest lesson you learned from Iberê Camargo? In your trajectory, another important name was Spanish-born artist Julio Plaza, who became your husband. Was it his influence that led you to embrace conceptualism? Julio was an enormous influence in my trajectory. I met him when I went to Europe for the first time and stayed there for a year and a half. He then came to live in Brazil through a scholarship granted by the ESDI (Escola Superior de Desenho Industrial, School of Industrial Design), in Rio de Janeiro. When I lived in Madrid and other European cities because of a scholarship granted by the Institute of Hispanic Culture, I left behind my origins in Porto Alegre as a successful painter and engraver to embrace the newest and most radical experiences in progress in contemporary art in my generation, along with Julio who had other affiliations. At the time he produced works related to Concretism and Programmed Art, which influenced successive ruptures in my personal work. Of course, I was also influenced by other artists and other poetics of the time: Pop Art, minimalism, situationist artists, Fluxus, new technologies… I felt I was beginning my formation all over again and, as I saw it, it was crucial to start again from the onset. From 1969 to 1973, you and Julio were invited to teach at the University of Puerto Rico. Tell us about this period. At the Mayaguez Campus at UPR where we lived and worked we were faced with important new experiences in the practical as well as the teaching domains that had been forgotten or were unknown until then at the island’s social and cultural scenes. Only now there is an effort to recover the research and thesis realized at that time. Way Out and Way In were two concepts introduced by Argentinean art critic and writer Marta Traba (1930-1983), who then taught at the San Juan Campus, and classified arts and artists who worked on the political and artistic problems involving the island of Puerto Rico, or artists who had migrated to the continent and were constantly in the shuttle to New York and had developed an internationalist work integrated to the North-American culture. The Mayaguez Campus obviously was at the side of the “way out” artists but it also included teachers from other academic disciplines such as physics, math and history. Dean José Enrique Arrarás invited Spanish art critic Angel Crespo to develop a consistent art program, publish an art magazine, as well as a program of exhibitions in the university’s art gallery. Julio was invited to fill this gap as resident artist and I was to teach new programs. At the time, the campus developed an interchange with notable artists such as Italian Germano Celant (who coined the term Arte Povera), conceptual sculptor Robert Morris, art critic and historian Barbara Rose, and others. Dean Arrarás himself was a collector of contemporary art and personal friend of influential people from the New York art scene like Leo Castelli and Roy Liechtenstein. This highly creative, closed environment very different from that of the island went on for about four years, and no doubt it had a positive effect on our repertoires and experiences, mine, Julio’s and our students’. Another influence in your oeuvre, sometimes dubbed surrealistic, is Marcel Duchamp. I studied Duchamp’s work at USP (University of São Paulo) with art critic and historian Walter Zanini (1925-2013) from 1976 to 1980. However I only got to see his work face-to-face when I visited the Philadelphia Museum of Art in the early 1990s when I lived in New York on a Guggenheim scholarship. How can I explain his influence on my work? It is hard and at the same time so obvious as seen in the large shadow I painted of his ready-mades in the São Paulo Bienal of 1983. Irony, anti-art, false geometry, parodies, pseudo-science and especially his experiments he coined as Opticeries are all Duchampian lessons. What are concepts that frame your work? For the artist first of all it is the intention that counts. This comprehends everything the artist has in that time and place, and the means he has to manifest his ideas and above all what he makes of his understanding of the world. Many times this includes operating images, words and enormous layers of filters that intermediate the artist’s relation with reality. How do you describe your art? Do you see yourself as a conceptual artist? I draw and put my ideas on paper, and I also draw over photographic images in special to study the scale of the intervention in real space. Nowadays I use the computer but my handwritten notes continue to be relevant for the development of the project. 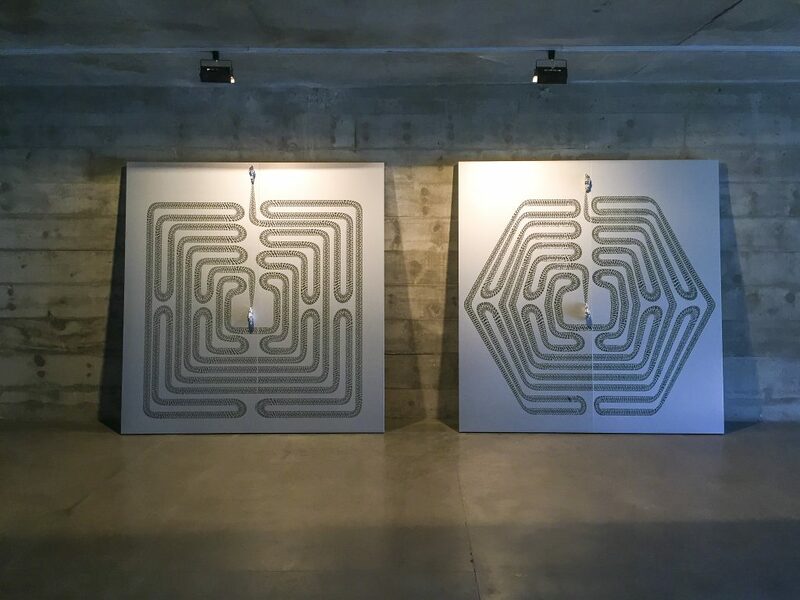 At São Paulo’s MuBE museum, EXIT exhibition by Regina Silveira, “15 Labyrinths” 1971, series of 15. 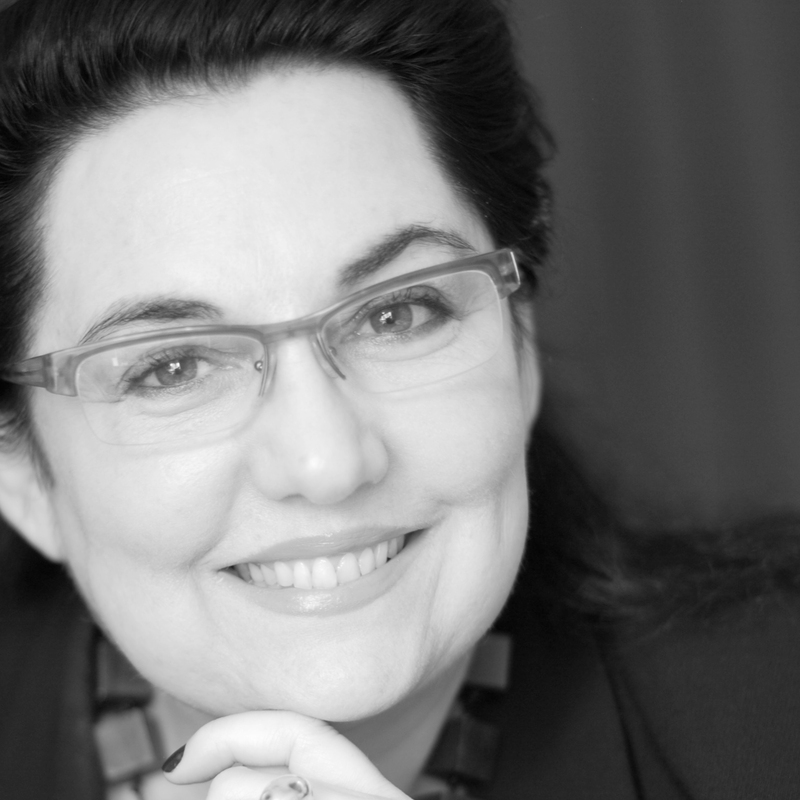 Photo Bruna Goldberger. You employed for many years a low-tech platform using adhesive sheets to create your architectural spaces and objects. When did you engage the computer as a tool? When I began working with the computer in the mid 1990s, it helped me gain more control over my projects developed from a distance, and facilitated the adjustment of the scale to larger spaces. It was a big help; works no longer needed to be physically transported internationally and could be produced locally. Many of the works using adhesive sheets cutouts are digital works produced in this new working environment. I believe one media does not eliminate the other instead they create a new productive combination. Recently I produced two virtual reality works—“Odisseia”(Odyssey, 2017) and “Borders”—with Itaú Cultural and HLRS (High Performance Computing Center Stuttgart), that is now on show at the MuBE museum in São Paulo. Both these works are on the top of the high-tech narrative, at least for now… I usually say they belong to the same illusionist chain that circumscribes a large part of my work since the 1970s. To wrap up, with six decades devoted to art what advice do you have for young, struggling artists? The artist is represented by Galeria Luciana Brito, São Paulo. 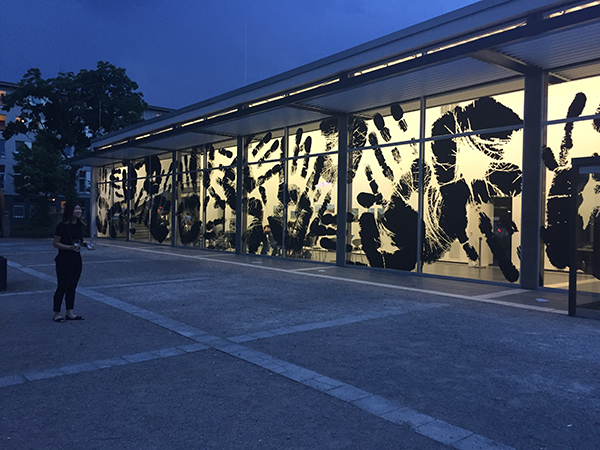 At São Paulo’s MuBE museum, EXIT exhibition by Regina Silveira, Irruption, 2017, sample of Praça Milton Santos public square. Photo Bruna Goldberger. At São Paulo’s MuBE museum, EXIT exhibition by Regina Silveira, on the wall “Middle class & co,” 1971. Photo Bruna Goldberger.